The recent demonstrations in Belarus, Tunisia, Bahrain, and especially Egypt have all recently demonstrated the importance of the Internet and social media as an organizing tool for popular protest. Twitter and Facebook have been crucial tools for organization and mobilization. Governments have noticed this as well, and begun to target the internet. China, for example, has long built an elaborate national filtering system known as the Golden Shield Project, and in 2009 it shut down cellphone and Internet service amid unrest in the Muslim region of Xinjiang. In Belarus, social media websites such as Facebook, Twitter, Youtube, and even Google Talk and Gmail were blocked in Minsk during and after December protests over election fraud. Internet traffic in Bahrain has been greatly slowed as protests have escalated in recent days. Activists in Iran have noted severe Internet slowdowns in recent days as well. Most notably, for five days in January and early February, the Mubarak regime essentially severed Egypt, a country with 20 million people online, entirely from the World Wide Web. Egypt’s ability to completely shut down the country’s Internet is instructive. In many authoritarian countries, the telecommunications infrastructure is in the hand off a single, state controlled carrier that dominates the bulk of international traffic through pipelines out of the country. Jordan, Qatar, Syria, Saudi Arabia, and Oman all have a dominant, state-controlled carrier that control Internet access and provide vulnerable choke points to shut off the country from the outside world. 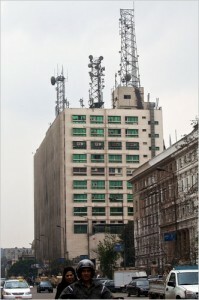 The Telecom Egypt building in Cairo where Egypt's regime "pulled the plug"
According to the article, “the US military has no shortage of devices—many of them classified—that could restore connectivity to a restive populace cut off from the outside by its rulers.” However, such tools present clear policy dilemmas for American decision makers. 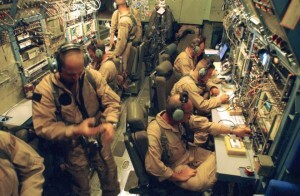 While it could give teeth to the Obama Administration’s belief in Internet freedom, and is subtler than the Bush Administration’s democracy promotion exercise in Iraq, this direct an infringement on sovereignty would still carry substantial risk. Many proposals require communications infrastructure flown over the country—a clear violation of their airspace and likely an act of war. As Wired notes, “The trouble is, if a government follows Egypt’s lead and turns off the Internet, it’s not going to be keen to see a meddling foreign power turn it back on. That act might not be as provocative as sending in ground troops or dropping bombs. But it’s still an act of what you might call forced online entry — by definition, a hostile one.” In the 21st century, whether to intervene electronically in a country may well be as fraught with peril as intervening military. David Crockett is a freelance political research analyst with a background in human rights and foreign policy. He has previously worked in South Africa and Eastern Europe.